Disappointing. 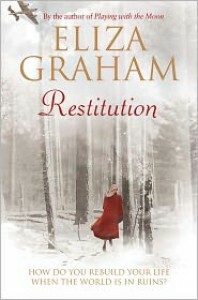 I loved Eliza Graham's Playing with the Moon and was looking forward to Restitution but I was left very dissatisfied by it. I didn't like the way the story kept moving backwards and forwards in time every chapter; I found it hard to keep track of what was happening and who was who and it made the story too fragmented and choppy. I also felt I should have been more moved by the plight of the characters and their circumstances but I wasn't. I persevered with it but it was only OK for me, rather than good.